PC: People actually get scared when they're trying to make choices for their homes. What's the best way to encourage us to stop worrying we're breaking some design rule and do something fun? JA: I would encourage people to think about how much of a bummer safe design is. When you look back at your life, you will remember the patterned lampshades and novelty pillows, not the boring beige carpet. 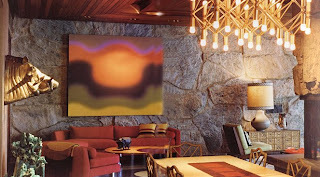 PC: How can you introduce a fun, campy or kitsch vibe into a home without going overboard? JA: Carefully. I believe that design should be chic and happy at the same time. I think the key is to strive for a classical foundation--good proportions, timeless sofas, furniture you won't get sick of--and then add a layer of playful punctuation with accessories. PC: Are there certain elements you try to include in all of your work? JA:Yes. Hanging chairs, orange, and ping pong tables--these are the three fundamental building blocks for happy homes. PC: What do you think is the biggest mistake people make in decoration their homes? JA: Decorating for the neighbors rather than themselves. To read the rest of the interview, click here! 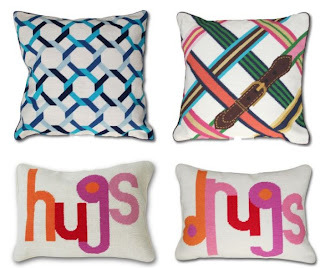 New from his pillow collections...such fun designs! 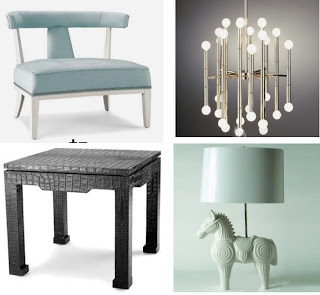 Beautiful furniture pieces and lighting - I want that chandelier! You're right, his designs are so chic with fun added in. I love his answers to the questions, especially the part about not remembering the boring beige carpet. Great approach! hey there! thanks for the comment on my blog. i sent you an e-mail with the rest of the peru photos to your hotmail, but i keep forgetting if you check your gmail or your hotmail more. anyway, hope you are having a great week! 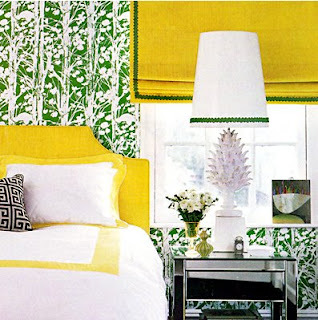 That yellow and green bedroom really pops. I love the HUGS pillow. Someone should make a RELAX pillow.